In 1979 I was employed as a Local History Tutor with Derry Youth & Community Workshop. 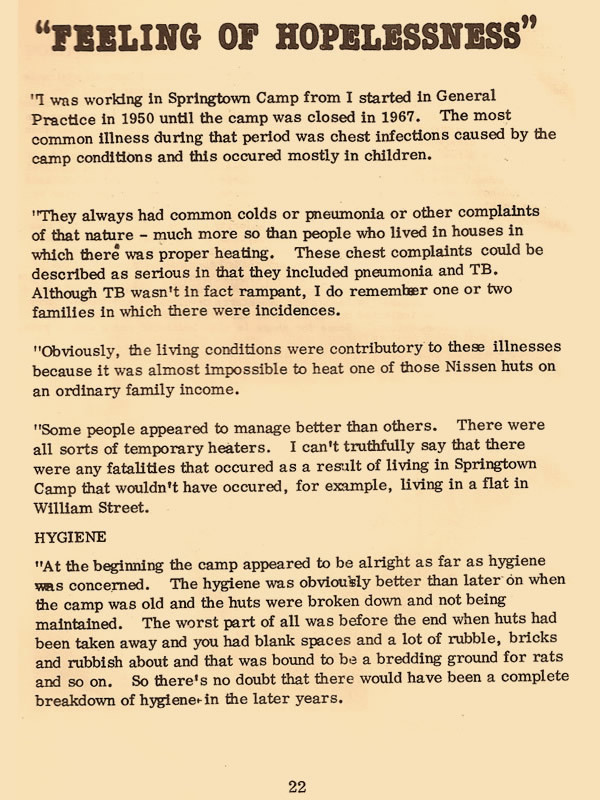 In February 1980 I published a 28 page booklet on Springtown Camp. The origins of the project were very simple- I went into my room one morning and the young people I was working with at the time were engaged in a discussion about Springtown Camp.As far as I can remember the discussion was initiated by a young lad called Jimmy Doherty from Rinmore Drive who was telling the rest of them about some of his granny's memories from the camp.I then suggested that we write a book on the camp as a project for the group.As you can imagine this was greeted with a great deal of scepticism at first but as we started to go out and interview people the interest and enthusiasm began to increase.The end result was the booklet which you are now posting on your website.I'm sure the visitors to your website will find it interesting and nostalgic. Finally,Hugo,isn't it ironic that,having been the first to actually publish anything about the camp,I also ended up acting in the recent play! To have been involved in both has been a privilege.